Education has played a central role in Islam since early times, owing in part to the centrality of scripture and its study in the Islamic tradition. Before the modern era, education would begin at a young age with study of Arabic and the Quran. Some students would then proceed to training in tafsir (Quranic exegesis) and fiqh (Islamic jurisprudence), which was seen as particularly important. 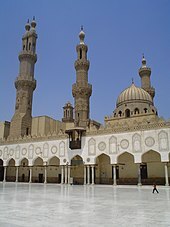 For the first few centuries of Islam, educational settings were entirely informal, but beginning in the 11th and 12th centuries, the ruling elites began to establish institutions of higher religious learning known as madrasas in an effort to secure support and cooperation of the ulema (religious scholars). Madrasas soon multiplied throughout the Islamic world, which helped to spread Islamic learning beyond urban centers and to unite diverse Islamic communities in a shared cultural project. Madrasas were devoted principally to study of Islamic law, but they also offered other subjects such as theology, medicine, and mathematics. Muslims historically distinguished disciplines inherited from pre-Islamic civilizations, such as philosophy and medicine, which they called "sciences of the ancients" or "rational sciences", from Islamic religious sciences. Sciences of the former type flourished for several centuries, and their transmission formed part of the educational framework in classical and medieval Islam. In some cases, they were supported by institutions such as the House of Wisdom in Baghdad, but more often they were transmitted informally from teacher to student. While formal studies in madrasas were open only to men, women of prominent urban families were commonly educated in private settings and many of them received and later issued ijazas (diplomas) in hadith studies, calligraphy and poetry recitation. Working women learned religious texts and practical skills primarily from each other, though they also received some instruction together with men in mosques and private homes. In Arabic three terms are used for education. The most common is ta'līm, from the root 'alima, which means knowing, being aware, perceiving and learning. Another term is Tarbiyah from the root of raba, which means spiritual and moral growth based on the will of God. The third term is Ta'dīb from the root aduba which means to be cultured or refined in social behavior. Syed Muhammad Naquib al-Attas described the Islamic purpose of education as a balanced growth of the total personality through training the spirit, intellect, rational self, feelings and bodily senses such that faith is infused into the whole personality. Seyyed Hossein Nasr stated that, while education does prepare humankind for happiness in this life, "its ultimate goal is the abode of permanence and all education points to the permanent world of eternity". According to the Nahj al-Balagha, there are two kinds of knowledge: knowledge merely heard and that which is absorbed. The former has no benefit unless it is absorbed. The heard knowledge is gained from the outside and the other is absorbed knowledge means the knowledge that raised from nature and human disposition, referred to the power of innovation of a person. The Organization of the Islamic Conference (OIC) has organized five conferences on Islamic education: in Mecca (1977), Islamabad (1980), Dhaka (1981), Jakarta (1982), and Cairo (1987). ^ a b c d e f g h i j k l m n o p q Jonathan Berkey (2004). "Education". In Richard C. Martin (ed.). Encyclopedia of Islam and the Muslim World. MacMillan Reference USA. ^ a b c d e Lapidus, Ira M. (2014). A History of Islamic Societies. Cambridge University Press (Kindle edition). p. 217. ISBN 978-0-521-51430-9. ^ a b c Lapidus, Ira M. (2014). A History of Islamic Societies. Cambridge University Press (Kindle edition). p. 210. ISBN 978-0-521-51430-9. ^ a b c d Staff, Writer. "Islam - History of Islamic Education, Aims and Objectives of Islamic Education". education.stateuniversity. ^ Mutahhari, Murtaza (2011-08-22). Training and Education in Islam. Islamic College for Advanced Studie. p. 5. ISBN 978-1904063445. ^ Fathi, Malkawi; Abdul-Fattah, Hussein (1990). The Education Conference Book: Planning, Implementation Recommendations and Abstracts of Presented Papers. International Institute of Islamic Thought (IIIT). ISBN 978-1565644892. ^ Viv, Edwards; Corson, David (1997). Encyclopedia of Language and Education. Kluwer Academic publication. ISBN 978-1565644892. ^ Staff, Writer. "Education". oxfordislamicstudies. This page was last edited on 13 March 2019, at 13:19 (UTC).